Back to the coat! It’s from BurdaStyle, 09/2016 # 116. Their sample is in mohair knit, all of mine are not! I’ve made this in espresso sweatshirt fabric (my muslin, but not posted) and black minky plush – great pattern, lots of opportunity for playtime. I made this one full length so it will cover any tunics or cardigans I’m wearing. And in these pics I’m wearing sarouel pants, but you’d never know it! I sewed size 38. It is very loose and generous in size and coverage. The center back seam is 44.5″ long (my minky one is shorter at 39″). 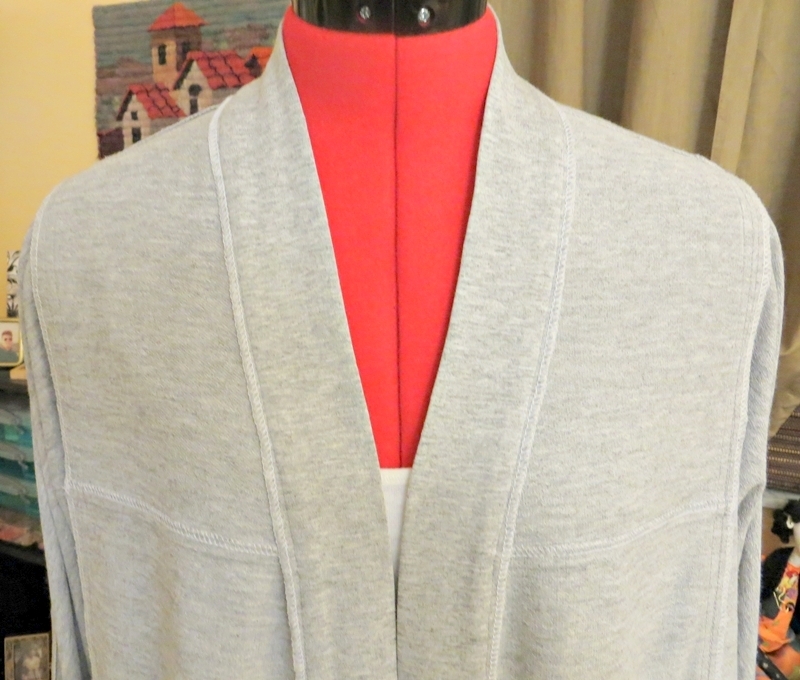 As before, I used front and back neckline facings rather than turn in seam allowances on the edges. I like the weight and structure that the facings bring to the coat. 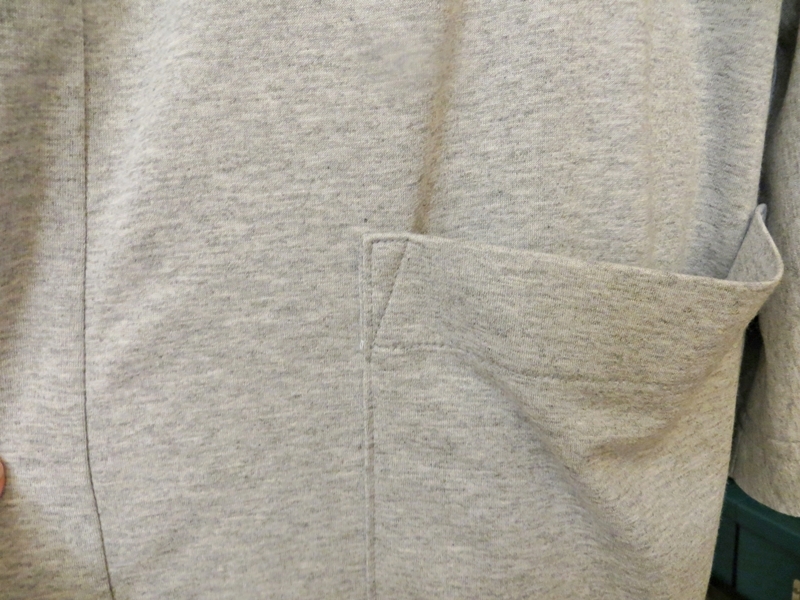 On this version I drafted a ‘smaller’ pocket that is attached on the front only, instead of being across the side seam. 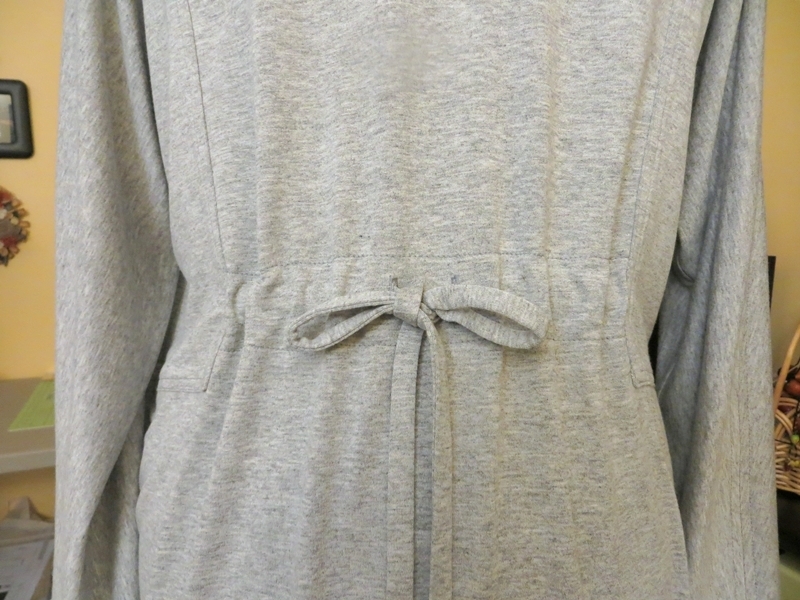 The big sleeve on the original pattern connects to the coat at the waistline. I decided to redraft mine to finish about 3″ above the waist, so that I can use a belt if I like. And here it is with a belt (no, it’s not a robe, it’s a wrap shawl collar coat) ! No, I’m not losing my marbles, but I’ll admit this muslin has a bit of personality. Despite its Easy rating, this lined Lisette coat is a fairly complex design. Tricky bits – the one-piece shawl collar, side/sleeve gusset, and pocket detail. Kick in a lining, and it’s definitely not a beginner project. 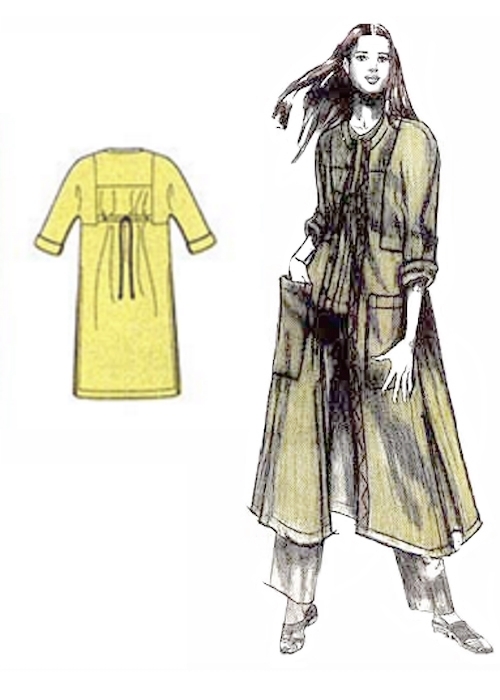 Note the slight narrowing of the silhouette – it’s real (hence the back pleat), and it does encourage the coat to open below the button, as seen on the model. Since I purchased the pattern to make a jacket, the latter doesn’t bother me. I sewed the size Small – great fit. My jacket is unlined, since I would seldom need the warmth of a lining. I shortened the length by 7.5″, to finish at 29.5″ below the base of the neck. Of course the back seam is too low for a jacket profile, so I raised it to finish about 3/4″ below the side/sleeve gusset seam. And I decided to gather the back skirt, rather than use a pleat (pleats that go awry make me nuts). Once I had the jacket constructed, I played with the collar. Without the ‘balance’ of the longer length, the collar is just too wide. I narrowed one side (the arrow side) so I could compare the two. I’m going with the narrowed version. And it’s time to think about a suitable fabric. The pattern suggests wool blends, boiled wool, mohair, wool flannel, and tweeds, and I agree a soft but stable fabric would work best. Thinking of everyone impacted by severe weather this week, I hope you, your friends, and your loved ones are safe. I’ve really been enjoying my fleece fabric adventures this year. So I went for the full Monty. During my recent trip to Orlando, I managed a visit to the Sewing Studio Super Store in Maitland. And in the Annex, I found this black minky plush, a real bargain at $4 a yard. Irresistible. Note on the store: high-end knit and quilting fabrics, ditto the trims and so on, and more built-to-purpose specialized sewing machines than I’ve ever encountered in a fabric store. The Bargain Annex is spotty, and I felt lucky to go home with a piece of fabric. I already had a pattern in mind, BurdaStyle 09/2016 #119 – a beautiful design, simple and elegant. 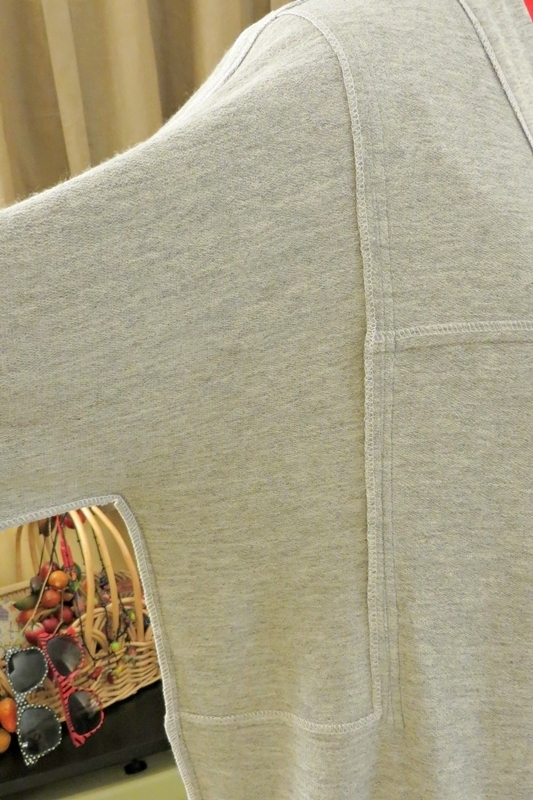 I had recently worked on a muslin in sweatshirt fabric, so my confidence level was high. It’s so nice! I know it’s hard to see the details in black, but please squint a little. I sewed a straight size 38. I didn’t line the pocket, but I did face the top fold to stabilize it. I shortened the length quite a bit. The original CB length is about 44″. I took off 5 1/2″. It just seems more balanced and interesting in the shorter length. Incredibly, the coat has no front or neckline facing. I added both, self fabric without interfacing. My sleeve and coat hems are a little less than 3/4″. I’ve found that a deep hem on fleece doesn’t always work well. I sewed all my seams with a long stitch (3.2 on my Juki) and topstitched with a 3.4 length. And used a 90/14 ballpoint needle in my sewing machine. Also 90/14 universal needles in my serger. I also decreased my presser foot pressure, from it normal 5 setting, to 2. I had just enough fabric to make a neck scarf. This is hanging out on my sofa, it’s so warm on my neck. I had just come home from the grocery when I took all these pics. It felt wonderful in that cold cold store! Will I ever sew minky again? Sure. It was very messy, but I really like this coat!! It’s perfect weather for working on jackets and coats. 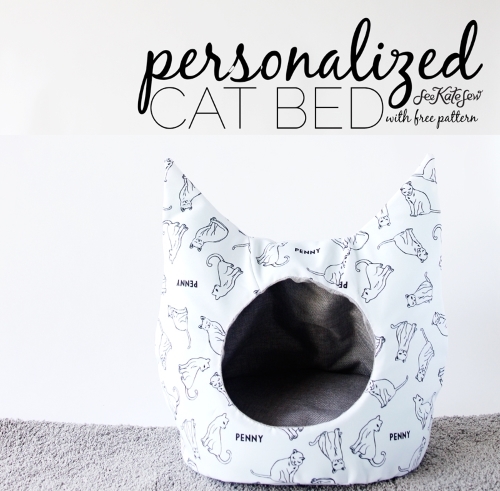 It’s a nice pattern with unexpected collar options. Views A and B have an attached collar, whereas views C and D have a ‘traditional’ shawl collar (the front extends into the collar). Just for giggles, here’s the line art from last year’s B6406 – exactly the same as views B and C on B6251. Go figure. Anyway…I did a muslin of this several years ago, view A, the jacket, in a very stable ponte from Girl Charlee. I found that the center front ended right at my crotch (I hate that word). And that the collar turned very nicely in the ponte. I even did buttonholes! I tried to use that info on this fleece version, and was partly successful. I added 2″ to the length and also lowered the CF curve by 1.5″. The jacket ends in a nice place in front – but the collar is just too bulky to do a natural fold. Lemonade! Actually, I love this with the collar up! It’s so warm on the back of my neck. It’s meant to have a 3-snap closure, but for now they’re on order from Wawak. No way am I attempting buttonholes in fleece. This jacket will live in my car, to be grabbed for that cold cold trip into the grocery. The place that will trigger my Raynoud’s syndrome if I don’t wrap up (pic is from last December, after shopping for Xmas groceries). I asked once – they keep the A/C on 70 degrees. Moving on – the ponte coat fail, BurdaStyle 90/2010 #127. I love the design and style, but it is just too big for me, even after I re-drafted it. I think the issue is that I used 4-way stretch ponte. It just keeps growing. It’s not meant for a knit, but I just had to try it 🙂 It’s so pretty. Parting shot: my Three Kings Day zygo cactus. Our cool weather kicks in a little late for Christmas blooms. What next? After a rather rocky start to 2018 sewing, I’ll have to think about that a bit. Tempting me – I still have a taxi yellow fleece in my stash. Outrageous, right?! Not I! 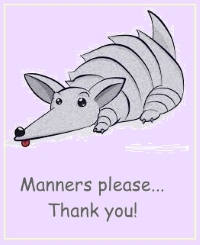 I’ve spent hours in the past few weeks, just cruising duster patterns and lots of wonderful makes by sewists in the blogosphere. Irresistible. I especially like the new Berlin Jacket by Tessuti and the Esme Maxi Cardigan by Named Clothing. But I didn’t particularly want to invest in a new pattern. Trawling through my stash, I pulled out an oldie but goodie, the Heading for Adventure coat by Louise Cutting. 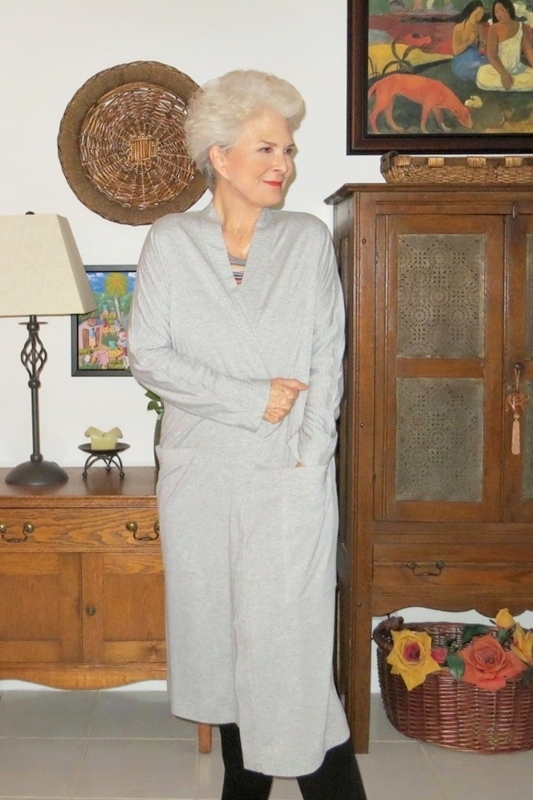 I made it in linen way back in 2010, but it was very large on me, even thought I sewed the size Small. 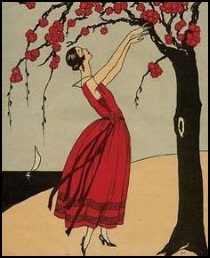 And the linen really bugged my skin – I never wore it. Nonetheless, the design details are so appealing. I love the piecing and topstitching. And Cutting’s techniques, which are beautifully articulated in the pattern instructions, are incredible. It was a great starting place. But I wanted to go with the lines of the dusters I mentioned above – a softer neckline, an attached band, and slim-ish sleeves. 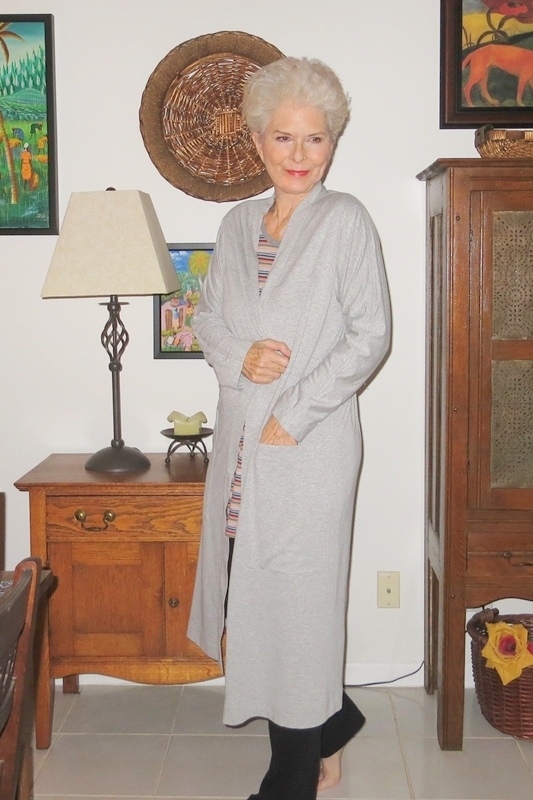 And I wanted to use a knit fabric – a very lightweight rayon/spandex French terry that I purchased recently from Fabric.com. 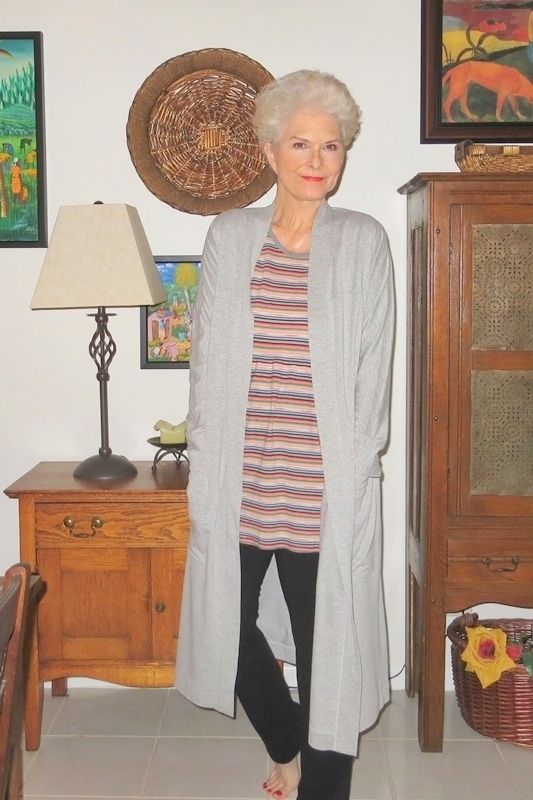 and the Grainline Studio Driftless Cardigan to alter the sleeves (I removed almost 6″ from the width at the upper arm – the sleeve was voluminous). This sounds like a lot of tweaking, but it was not difficult, because the Cutting coat is all right angles. It was easy to lay it out and draw on it with chalk. I love the back drawstring! 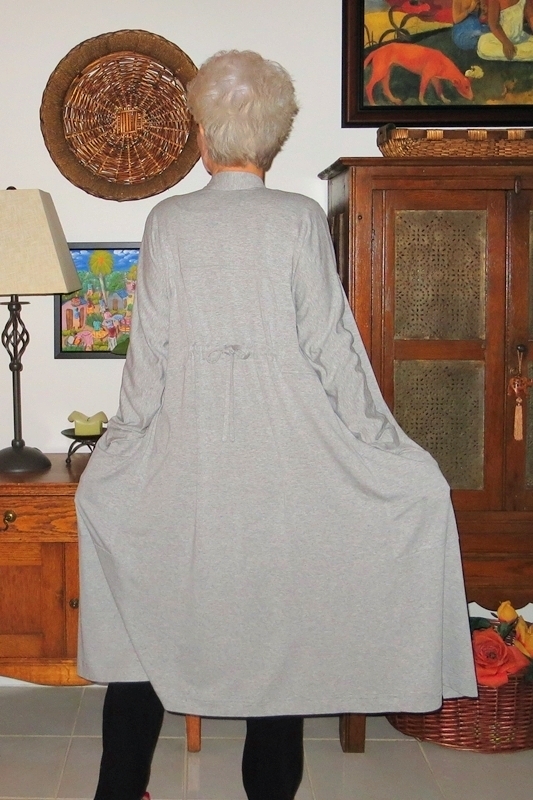 It looks very similar to the back of the StyleArc Winsome Designer Dress (posted here), but the construction is not the same, due to the placement of other pieces in the back. The patch pockets are very over-sized and long. Fun!